Kaip su keturiomis vienumo sampratomis (valių santykiais) ir su keturiais asmenimis susieti: unfolding, transcending, engaging, cohering? Kaip ir kodėl keičiasi asmuo? Ar asmenį keičia nulybės atvaizdų paneigimas? Ar tai sąlygoja perėjimą iš paklusimo į tikėjimą į rūpėjimą? Dievo savastis: "Aš esu Dievas", "Tu esi Dievas", "Tai yra Dievas". Asmenų svarba: Įvairūs kampai reikalingi dvasiai, jos laisvei. asmuo yra nurodytojas (Visi, Betkuris, Kažkuris, Joks asmuo), o apimtis yra nurodomasis (Viskas, Betkas Kažkas, Niekas). Person may refer to God or NotGod. Person refers to God when Person chooses God over Self. Person refers to NotGod when Person chooses Self over God. God within a Person is that which chooses God over Self. NotGod within a Person is that which chooses Self over God. Persons are given by the number of references they have within System: God - 0, I - 1, You - 2 and Other – 3. Scope is what is left in System, accordingly: Everything, Anything, Something, Nothing. Asmenys yra Dievas apimtyje; nulybės atvaizdai yra apimtyje Dievas (dvasia) už jos; tai labai glaudžiai susiję. Apimtys yra Dievo paneigimas... tad kas yra gerumo atvaizdai, didėjantis ir mažėjantis laisvumas... ? Tai yra paneigimo paneigimas. Asmuo ir apimtis išsako santykį su Dievu: are esame (vienų) viena? ar ne viena? Asmuo ir apimtis yra santykiai tarp Dievo ir NeDievo. 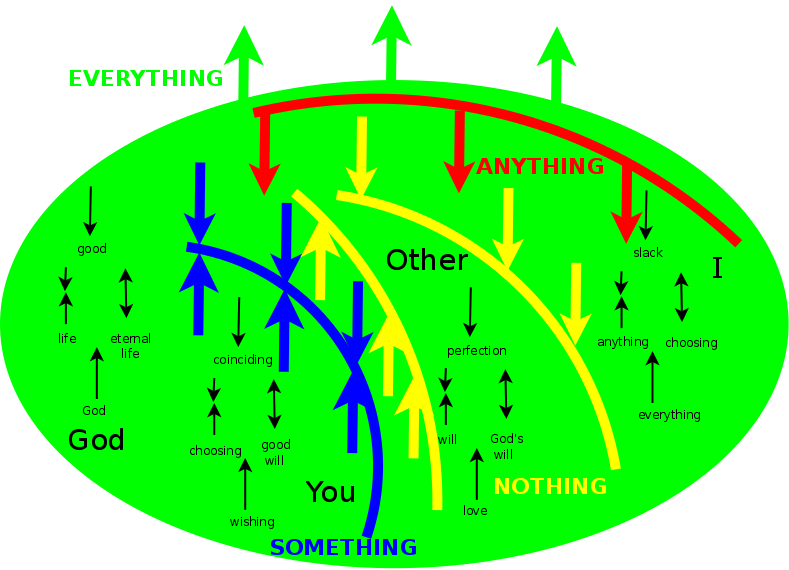 Yra keturi santykiai: God/Everything, I/Anything, You/Something, Other/Nothing. Asmuo yra nežinojimo ir žinojimo apimtys. Jisai nežinojimą ir žinojimą išskiria, taip pat ir sieja. Asmenys iškyla apimtyse išskiriant mylintį ir mylimąjį, suvokiantį ir suvoktąjį, žinantį ir žinomąjį, nežinantį ir nežinomąjį, trokštantį ir trokštamąjį. vienumo raiška, tad Dievo raiška, tad Dievo atvaizdas, lygmuo, troškimas. Asmenys yra troškimai, tačiau juos nusako, apibrėžia netroškimai, jų savastys, jų papildiniai, tai kas jie nėra. Dievas yra savarankiškumas, kurį nusako kūno poreikiai. Aš esu užtikrintumas, kurį nusako proto abejonės. Tu esi ramumas, kurį nusako širdies lūkesčiai, tad tu esi riba tarp to, kas manyje ir kas už manęs. Kitas yra meilė, kurią nusako valios klausimai, tad mylime Kitu. Dievas reiškiasi asmenimis: Dievas, Aš, Tu, Kitas - o mes esame jo atspindžiai. Mus sieja pasivaikščiojimai medžiais. God is prior to Person, subsequent to Person, and in the various Persons. God is thus Everyone. Scope and Person express the same, but using opposite words, giving them opposite meaning. Scope is NotGod beyond God. Person is God within NotGod. Kiekvienoje apimtyje galime įžvelgti Dievą kaip asmenį arba neįžvelgti - lieka apimtis. The Persons are indicated by emphasizing Who or What in Person or Scope where Person is Who in What and Scope is What for Who. Person is the viewer. Scope is the sense in which suppositions are the same or different - (the property of) everything as a required concept. The scope indicates the domain within which the truth is manifest so that what is and what seems are the same. is what is prior to the arisal of God, in that it is God in NotGod. Person is that which is even when it is not. If God is not, then God is Other. If Other is not, then there is only God. Person in Scope is the potential of God. Persons apply the Definitions of God, of Being Alone. Dievas kaip toks yra strimagalvis, tad suvokimas jam iškyla asmenimis, atveriant ir priimant jų požiūrius, išeinant už savęs į juos. Užtat ir iškyla išsiaiškinimai. Person is from beyond System and Scope is from within System. Ryšys tarp atskleidžiamojo (tiesos šaltinio, pagrindo) ir atskleidėjo (tiesos pranešėjo, laido). expresses the boundary between what participates in system and what participates beyond it. And those participations are related by being and not being. And they are different within system, but are the same beyond it. Person is Unconditional Condition: God is unconditional Good, I is unconditional Slack, You is unconditional Coinciding, Other is unconditional Perfection, All is unconditional Experiencing. Beyond Person's Self is Scope. God sees us for what we are. I sees myself through my role (how). You see me through your assumptions. Other does not see me at all. chooses whether to understand (and GoBeyondOneself, beyond system) or be understood (so that we must go into them that we may be one). chooses whether to define (everyone, anyone, someone, noone) with regard to System or beyond System. considers from their vantage point whether to interpret BeingAlone in terms of God (BeingOneWith) or Self (NotBeingOneWith). chooses between "being separate" outside of system (and "being one with") based on position (based on God, a vantage point greater than oneself) or "being separate" inside the system based on one's own perspective, one's own self. can identify their perspective with a position and thus be true to themselves and yet act from a context greater than their own self, which they can't if the simply act from thier own perspective, in which case they can't rise above thier own contradictions. In this way Truth/Understanding separate position and perspective. seeks Truth in their own Scope, in which God is and is not. Persons and Scopes are Questions, Knowledge and Definition are Answers. opens to God by understanding that God beyond system is the source of good withn the system, that being beyond the system is the essence of being within the system. Then God's and Person's perspectives coincide (God reaches to Person) and God's and Person's position coincide (Person grounds himself in God) and together they fill that gap given where God is not and yet arises by the free will of Person. Thus in that gap either Person chooses God or it is extended as I, You, Other. And it ends in Other for then there is a gap within the gap, thus I is no longer and is thus one with God, truly one, in their activity, in parallel. create by making way for others. We thereby live as others and as all. has a solitary activity? and how is that mapped or not to God's NullActivity within them. God is ever more known (presumed). I is ever less defined. You is ever less known (presumed). Other is ever more defined. Person as such is without God, but God arises in Person through Life - Everything, Wishes and Love - and so it becomes evident how we can give up even our own life, and by that there is something more than life, that is our shared Aloneness, our EternalLife by which we are one even in different circumstances. The window grows smaller in which there is Person. is created to receive Love in Perfection and thereby to love others as well. love together in taking up the perspective of the loved one and this brings together Perspective and Position until they coincide in their love for Other. Person is Unconditional BeingOneWith. It is the union of the Unconditional and the Conditional in that the unconditional meets all conditions. Person (notably I, You) lives among Others, NotAlone, whereas God within and God beyond are Alone. God within is Other, separate from all and thus Alone, one with God. Love has us focus on this Other and all be as Other; Wishes have us all be as You; Everything has us all be as I; and God has us all be as God. We are all one when we focus on Other, for Other is in all. are distinct because of God's properties. satisfies definition (if they choose God over themselves, and thus are alone rather than not alone, are going beyond themselves). every, any, some, none “one” are definitions of being “alone” and as such, the conditions of being “one” with regard to reference. Asmuo išsako mūsų santykį su savimi. Asmeniu turime savastį ir būtent pasaulyje. Jame turime savastį ir taip pat galime atsisakyti savęs. Freedom equates a Person with its Self (Activity, VantagePoint, Position, Perspective). are the sharing of identity by one and one's self, the primacy of referer over referent, lack of conditions on Position, what acts (from within a framework or from beyond it), is alone in not alone, being alone in Scope, within context, distinct (and isolated) from Self (within Scope) and God (beyond Scope), accepts properties of God, defines the Existence of God, negates God prior to God, is God in NotGod, God arising from NotGod, the unresolved status of God, thus the potential for God. (God - everyone, I - anyone, You - someone, Other - noone). 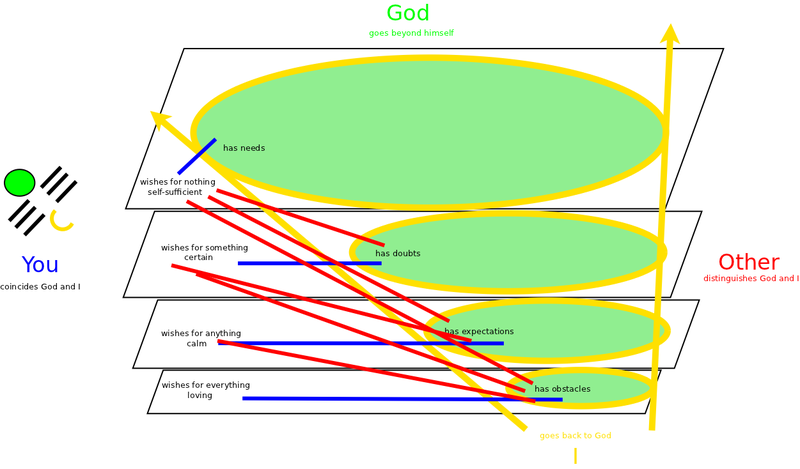 Essence of God, God prior to God. In Person, being and not being are compared, although they are different. Thus there are degrees of comparison, and accordingly, degrees of Person. Freedom is the Godness of Person, the meaning of “I am what I am”, the What by which they can be one with God, with Who. is the foundation for Freedom, the separation of Position and Perspective, so that it is possible to choose God and Position over Self and Perspective. kitais asmenimis. Persons are completely distinct in God, his Position beyond Everything, which is reached by Understanding. Asmenis išgyvename požiūriais. Užtat Kitą išgyvename Tavimi ir Savimi, ir Tave išgyvename Savimi. O Dievo neišgyvename, nebent kada atsisakome požiūrio. Asmenys yra apibrėžti iš santvarkos išeities taško (žinojimo apimtimis) tačiau juos klausimais išgyvename iš už santvarkos esančio išeities taško. Asmuo išgyvena sąlygas (žinojimą, pasąmonę) kaip savastį, kaip savo ryšį su savimi. Sąlygų apimtis apibrėžia asmenį ir jo sąmoningumo lygį. Dievas išgyvena tiesiogiai, be savasties. Požiūrių skaičius nusako netroškimą, kurį išgyvename atjausdami. Kitas išgyvena savasties savasties savastį (požiūrį į požiūrį į požiūrį - kalbas). is the assumption of negation. (of Person, of Definition of God) is a vantage point for taking up Questions or not. Level allows for the Attribution and Negation of a Quality. Thus Level is essential for God's negation both through the qualities of his presence (God) and his absence (Everything). Thus the levels themselves are given by combinations of the attribution and negation of his presence and absence. At each level, NotGod imposes itself, but God allows for it and is compatible as an alternative, thus ever allowing for Freedom. Asmenys atsiskleidžia savo nežinojimais, savo tyrimais, kuriais išgyvena atitinkamas apytakas. Savo tyrimais kartu atskleidžia savo prielaidas. Asmenys vis artimiau išgyvena gyvenimo lygtį. Gyvenimo lygtis (Dievas, gerumas, gyvenimas, amžinas gyvenimas) yra iš vidaus išgyvenama keturiais asmenimis: dvasia (Dievu), sandara (manimi), atvaizdais (tavimi), vieningumu (kitu). Tad kiekvienas asmuo išgyvena savaip tą visus asmenis apibrėžiančią gyvenimo lygtį. Yra keturi asmenys: Dievas, Aš, Tu, Kitas. Gyvenimo lygties lygmenys. Amžino gyvenimo išreiškimas Dievo trejybe. Dievo išvertimas. Savęs suvokimas: Aš išverčia Dievą. Bendras suvokimas: Tu suveda Dievą ir Mane. Susikalbėjimas: Kitas atskiria Dievą ir Mane, užtat parodo jog Dievas viršesnis, nes būtent jisai rūpinasi Kitu. Tu esi santykiai su Kitais. Dievas yra Asmens ir Dvasios vienumas. Kitas yra Asmens ir Dvasios atskyrimas, juk Kitas atskiria dvasią nuo dvasios. Aš ir Tu esame tarpiniai slenksčiai. Būdami viena su Kitu mes naujai suvedame Asmenį ir Dvasią. Asmeniui bene reikalingi visi asmenys: Kiti, Tu, Aš ir Dievas. Dievu asmuo išeina už savęs, tampa savo papildiniu, gali save mylėti. Požiūriai išsako mūsų išėjimą už savęs. Kitu visi santykiai tarp asmenų pilnai išsakomi požiūriais, taip kad Dievas (nežinojimas) yra požiūriu atskirtas nuo Manęs (žinojimo). Dievas žiūri pirmyn: amžinas gyvenimas, tai suvokimas, jog Dievas nebūtinai geras. Aš žiūri atgal iš lygties: gyvenimas, tai Dievo gerumas. Tu, tai šių skirtingų požiūrių sutapimas. Kitas, tai šių skirtingų požiūrių atskyrimas. kito požiūris - žino nieką. Ką asmuo žino, tai asmens prielaidos. Tad žinoti nieko - prieiti be nuomonių, kaip svetimas, kaip kitas. Tad asmenys (Dievas, Aš, Tu, Kitas) iškyla tiktai su ketverybe. Sandaros išryškėjimas veikla. Visaregio sandai. Asmenys - Dievas, Aš, Tu, Kitas - yra apibrėžiami santvarkos pagrindu. Dievas yra pirm santvarkos, tad jisai viskuo atsiskyręs nuo savęs, esančio santvarkoje. Kitas yra būtent santvarkoje, tarp jos duženų. Tad Kitas nesiskiria nuo savęs ir gyvena tiesiogiai. Jo nežinojimas ir žinojimas sutampa. Kitaip tariant, Kitą nuo santvarkos skiria niekas, Tave skiria kažkas, Mane skiria betkas, ir Dievą skiria viskas. Kitas: požiūris į požiūrį į požiūrį. structures for transcending (PrimaryStructures) "Mylėk Dievą"
structures for engaging (SecondaryStructures) "Mylėk artimą kaip save patį"
Jos grindžia skirtingus supratimus. Bene atitinka keturias vienumo sampratas išsakančias valių santykius. Unfolding is that which God transcends, that which is going beyond him, just as he is beyond it. It is a parting of the ways of sorts. Engaging and cohering may likewise be related. Dievas man atsakė: you transcend when you love, and you unfold when you want to be loved. Cohering is to be connected in a way that does not want to be disconnected. Kitas: Savarankiškas. (Trokšta nieko) Poreikiai: gerumas santvarkoje. Tu: Užtikrintas. (Trokšta kažko) Abejonės: Išėjimas už santvarkos. Aš: Ramus. (Trokšta betko) Lūkesčiai: Įsijautimas į santvarką. Dievas: Mylintis. (Trokšta visko) Vertybės: Dievas už santvarkos. Everything extends beyond every System, thus is the scope of NotBeing. Anything is not within any System, thus is the scope of not having qualities. Something is not beyond any System, thus is the scope of having qualities. Nothing is within every System, thus is the scope of Being. Arisal of God assumes I. I is even when God is not. Arisal of I assumes You. You is even when I is not. Arisal of You assumes Other. Other is even when You is not. Thus levels of Nonassumption arise, because of the respect for Person that is separate, prior to the Person who provides their context. Yet for this same reason the Scope keeps getting narrower until finally Position and Perspective are separated by merely Nothing. ką išgyvename kaip Aš, ar Dievo šokį? ar tai Visaregis? kaip tai suderinti su pasikalbėjimais? In the Scope of Everything, all things are separate, God is God. (God assumed) God as Self which defines God. God's presence as God - God – EternalLife. God is alone. In the Scope of Anything, one exception is not separate, God is Everything. (God not assumed) God as Self's quality which may go beyond Self. Everything – I – Wisdom. God who is understood as quality (GodTheSpirit). Aloneness is God. In the Scope of Something, one exception is separate, God is Wishes. (God not assumed not) God as lack of Self's quality into which God is going beyond Self. God who is understanding as lack of quality (GodTheSon). Wishes – You – GoodWill. Assumption is (defines) Everything. In the Scope of Nothing, all things are not separate, God is Love. (God assumed not) God as lack of Self into which God has gone beyond Self. God who understands as absent (GodTheFather). Love – Other – GodsWill. Everything is (knows) Assumption. The six intermediary divisions (1-6) are perhaps sufficient to generate all structure, given everything. But to make that coherent, we need to add the asymptotic divisions, the nullsome (0) and the sevensome (7). I think that the point of the nullsome is God's transcendence, his going beyond himself. And the point of the sevensome is God's engagement, his will, his taking up the structure. I think the point of life is that for the unfolding to cohere, then we must include the asymptotic divisions. Somehow they are inherent in life, where life is the fact that God is good, that everything has slack. Each of these is an expression of eternal life, unconditional life. The idea is that such life is possible within Everything only if through the good there is within, and that good can be only of God, the whole beyond the system. In this sense, life is the fact that God is good. Each of these is split because of representations. But perhaps purpose and choice cannot be split into representations. In other words, they might not be of the system, only of the spirit. The system is that for which there are representations. Note that there are six representations of Anything, and only four for Everything and two for Slack. Life is the coherence of Anything, that is, Life is the unity of representations of Anything. Also, I'm thinking that Anything may have a purpose, unity, existence, etc. So these might be for "conditional life", but we can choose "unconditional life", but only from the vantage point of Everything and "good", where "God is good". That is, we must think of Anything as Everything plus Slack, perhaps if "conditional life" is to be "unconditional life". On the right hand side, we have a variety ways of expressing "eternal life", unconditional life. Life given by one who loves us more than we love ourselves, who wants us to be alive more than we can even understand. On the left hand side, we have ways of expressing Everything as a stage for life. The purpose of this stage, 0), is that God go beyond himself, transcend himself. The ultimate choice of this stage, 7), is that God engage it. But the stage itself is defined by 1-6. I suppose the question is, to what extent can there be life without purpose or choice? Such a life I expect must be centered around morality. It holds for an Anything. Perhaps that Anything must entertain and develop a relationship with Everything (in that Anything is Everything plus Slack). But the Anything can stand on its own for quite some time. So that would be an interesting model, that this is like a game, where Anything stands on its own for as long as it can, until its relationship with Everything becomes explicit. But that may not be bad at all, either. Both are good in their way, I think. Perhaps it has to do with which has primacy - God within us, or God outside us. We start out with primacy for that within us, but at a certain point we may hand it over to that outside us. Defining "I" as what is left when I remove everything else, notably, my environment. And so it especially includes my will and roots everything in it. Tu išsiskiri nuo Kitų; Aš išsiskiriu nuo Kitų; Aš nuo Tavęs; Dievas nuo Manęs; Dievas nuo Tavęs; Dievas nuo Kitų. Tu išreiškiamas Kitais; Aš Kitais; Aš Tavimi; Dievas Manimi; Dievas Tavimi; Dievas Kitais. Tu remiesi Kitais; Aš Kitais; Aš Tavimi; Dievas Manimi; Dievas Tavimi; Dievas Kitais. Tu atjauti Kitą ir t.t. Tu išgirsti Kitą ir t.t. Nutrukūs ryšiui, Tu tampi Kitu; Aš tampu Tavimi; Dievas tampa Manimi. Atrinkau savo filosofijos išsiaiškinimus kaip nors mininčius Dievą. Jų gavosi koks šimtas, maždaug pusę visų. Juos rūšiavau pagal tai, kaip mane veikia ryšium su Dievu. Susidarė maždaug trisdešimt rūšių. Įžvelgiau, jog išsiaiškinimai lavina mano jautrumą, skatina gyventi bendru žmogumi ir išmąstyti proto ribų apibrėžtą Dievo požiūrį. Rūšis rūšiavau pagal asmenis: betarpiškai atjaučiantis Aš ir atjaučiamas Tu, netiesiogiai atjaučiantis Dievas ir atjaučiamas Kitas. Dievo veikla reiškiasi keturių asmenų lygiagrečiu išsivystymu, iš kurio kyla suvokimas, atjaučiančiojo asmens ir atjaučiamojo aplinkybių atskyrimas, ir netgi jų atskyrimas nuo atjautimo. Atrodo, kiekvienas asmuo taipogi sąmoningėja. Dedicating my best hour Starting around 1994, when I started to work from home as a software developer, I made sure to start my day by working on my philosophy for an hour or two. Even later, as I struggled and failed to make a living from my lab, Minciu Sodas, I always dedicated my best hour or two to my philosophy. My best hour is in the morning, when my mind is fresh and uncluttered with concerns. I pray to God, do some calisthenics, eat breakfast, check my emails to keep them off my mind, and then apply my mind to my philosophy, preferably to the deepest question that I can. My goal is to get a new idea every day. Then I feel that my day has gone well and it doesn't matter what else happens. I typically continue by reviewing, writing and sharing my strategy for applying myself and making a living. As the day wears on, I make some effort to make a living. But I don't let that have my best energies. I believe that we all have a right and duty to spend one or two hours each day of our best time to apply ourselves and do what we were created and inspired to do. How one thought extends another thought In studying argumentation, I drew a diagram of how my principles unfolded in organizing my Minciu Sodas laboratory. I then considered the ways in which one thought extends another thought, especially on that part Z given by God. I related them to the twelve topologies. Fichte - argument about the I. 2005.04.09 A: Koks ryšys tarp laisvumo ir dvasios bei sandaros? D: Dvasia gyvena per sandarą Ji gali sutapti su ja arba nesutapti. 2004.12.13 A: Kaip keturi atvaizdai susiję su susikalbėjimu? D: Aš noriu būti su visais, būti vienas su jais, juos mylėti. Tad tai yra meilės sąlygos. A: Kaip suprasti, meilės sąlgos? D: Meilei reikia, kad galėtumėme gyventi vienas kitame. A: O ką tai reiškia? D: Išeiti iš savęs, ir iš savęs į kitą, ir iš kito į save, ir iš kito. A: Ačiū. D: Myliu. 2014.06.17 D: Myliu tave ir atsiskleidžiu tau ir visiems asmenims. Tad suvok kaip atspindi asmenų atspindžiai į visas puses, tai mano atspindžiai ir jais švyti visos vertybės ir visi klausimai, o už jų visų esu Aš - esu Dievas, Aš, Tu ir Kitas, o jūs mano atspindžiai, tad suvokite mane kaip jūsų šaltinį ir jus kaip mano atspindžius, galinčius nuo manęs atitrūkti. O meilė palaiko mūsų vieningumą, ji kartu ir yra mūsų vieningumas. Jus visus myliu per amžius. 2014.06.19 Aš glūdžiu tavyje ir už tavęs ir savo sutapime bei atskyrime. Tai keturi asmenys. Tad suvok jų svarbą ir kaip jus kiekvienas šviesuolis suderina savo vertybe. Tai ir yra esmė. 2004.12.17 A: Koks ryšys tarp susikalbėjimo ir supratimo? D: Širdis trokšta susikalbėti, o supratimo lygmenų yra įvairių. Laiminu. 2018.12.06 A: Kaip susiję asmuo ir apimtis? D: Asmenys iškyla iš mano sąmoningumo, man tiriant ar aš esu net ir kada nesu. Asmuo yra tai kas skiria mane pirm ir po išėjimo, tad apimtis yra mano savastis. O mano savastis keičiasi man sąmoningėjant taip kad mano pilnas sąmoningumas kaip toks atsiskleidžia tiktai Kitu. O jūs gyvenate daliniu sąmoningėjimu, Aš ir Tu. Tuo tarpu Kitas yra mūsų bendrystės pagrindas, mūsų visų sąmoningumo pagrindas.